One of our coolest items! The soda can diversion safe offers a convenient hiding spot for your coolest items. 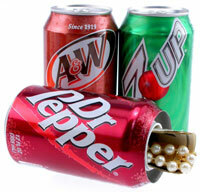 Brand name sodas are modified to contain a hidden compartment that is hidden from plain view. These are so easy to use! Just unscrew the top of the can and place your valuables, cash, or whatever else you have that you don't want found inside and screw the top back on. It will fit in with the rest of your drinks right in your refrigerator. Just be sure not to try to drink it! Choose from Coke, Sprite, 7UP, Cherry 7UP, A&W Rootbeer, and Dr. Pepper. Most everyone will have a can of pop in their fridge. Since these are made from actual cans of soda, they can be mixed right in with the rest of your drinks. Unless your burglar is especially thirsty, he's not going to be rummaging around your beverages trying to unscrew them. They want to get in and get out as quickly as possible to reduce their chances of being caught. By using this tiny cubby, you can keep your stuff in the "open" and not have to worry. Interior Dimensions: 1" x 3 7/8"
Why You Should Get One? If you have a lot of money in your house that is currently not in the bank, you probably keep it in a secret place. For some people, they will hide it in obvious hidden places like under the bed or in a small drawer in a desk. What most people don't know is that most thieves are not very smart and will never look in certain areas, but they will always look in places where the majority of people hide their money. What is a secret safe? This type of security device is basically shown as a small ordinary item in your house. For example, there are many kinds that look like ordinary beer cans or a salt container, but in reality, you can easily place cash inside. These types have hollowed compartments. A thief will never consider looking inside one of these because of their disguised nature. Investing in a quality stash-can is a way to prevent guests you allow in your home from stealing your money. The best part about these items is that they can make it seem as if there is normal product inside. These have some added weight to them to make it seem like it is full. When will an ordinary person or thief look inside of a soda can. A thief will never look inside of your fridge to find a nicely crafted diamond ring or a stash of $500. There is a hidden compartment that conceals the contents. You can choose from Dr. Pepper, Sprite, Cherry 7Up, AW, Coca Cola, and many others. It really doesn't matter what kind you choose. The important thing is that you look for a nicely designed one that you know will blend in well with your fridge. For example, buy a Sprite can if you have tons of other Sprite cans inside. The way to use these are simple. Simply unscrew the top out of the can to open it up. Place any valuables or cash you would like to hide inside of the soda can, and then screw it back on and place the can wherever you may choose. A secret safe is a great investment. If your home is prone to having money being stolen, hide your stuff and valuables today in one of the cool objects. Even if there are no burglaries that go on in your area, these are great for when you want to avoid having guests come into your home and steal your money and valuables. If you would like to get a different one, there are many to choose from. Just be sure that it fits into your home well.